If there’s one thing that so many of us always seem to struggle with when it comes to travel, it’s the time zone changes. Try as we might, it can be something that really takes a toll on our bodies. But if you want to make sure that you’re able to travel as much as possible and fit a lot of things in during your time away, you have to be able to adjust in the best ways possible. So let’s take a look at how you can do that. First of all, being healthy helps. If your body is strong, energized, and hydrated, it’s going to have a much better chance at coping with the change in times and dealing with a little extra tiredness than if you’re unhealthy and lethargic most of the time in life. You also need to fight your natural instincts. The best thing you can do is to just get on with the local time and force yourself to either stay awake or go to sleep. But you also have to make sure that you’re being as smart with your sleep as you possibly can. 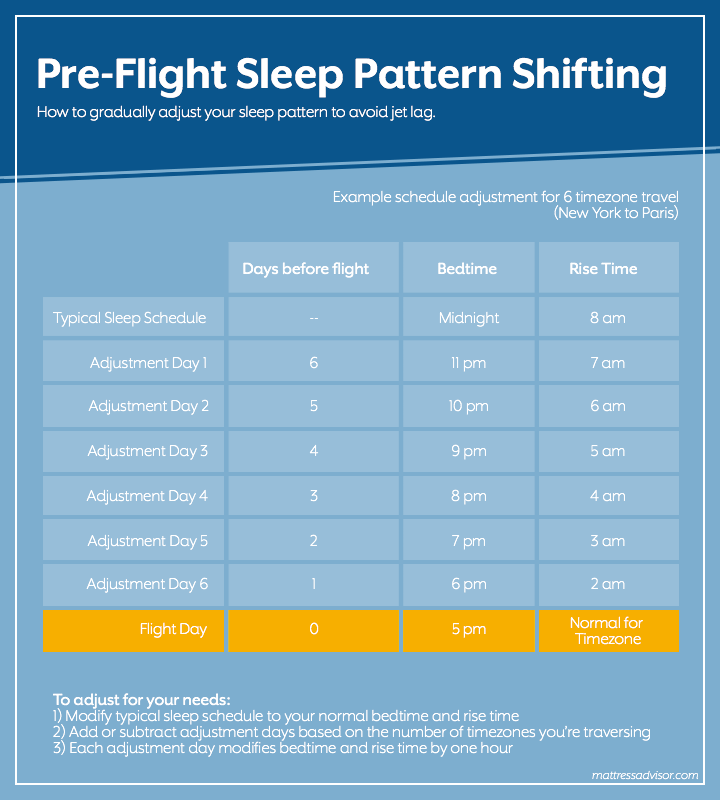 If you really want to make sure that you’re going to adjust right off the bat, adjusting your sleep before you fly is a great idea. Because then, your body will already be on the right time zone. Take a look at the infographic below to help you with this. Interesting post. I know lots of people have real jet-lag issues but we have never really been hit by it. Even our 29 hour flight to New Zealand was okay as we slept when it was dark and ate when necessary. Just adapt to the local timings for sleep and everything always seems fine. I’ve always just chosen to go along with the local time and maybe have a longer night’s sleep that first night there. But I think you have some excellent tips for those that have that problem. That’s what I usually do…try to stay up and go to bed at local time and wake up fresh. I’ve never had a problem with jet lag. My technique is to let the natural light reset my clock. I try to sit by a window because I like to look down at the scenery. On a long flight, I will doze off and on, and when I get to my destination, I’m ready to go. I think my brain takes cues from the light or darkness and the naps help me to not feel sleep deprived.